Wheel Of Fate | 2P START! We have to thank Sega for the comic idea this week because they made it too easy. Seriously, Sonic turns into a wolf? And that’s not an April Fool’s joke? Couldn’t they at least choose a different animal to pretend they weren’t copying Twilight Princess? To be honest, I didn’t like the idea of Link turning into a wolf and I really didn’t like playing as Wolf-Link either. Somehow I’m not bothered as much by the idea of Sonic turning into a wolf. First of all, he’s already an animal, so the change isn’t as drastic as with Link. Also, anything to prevent a wolf sidekick from entering the Sonic universe is fine by me (we don’t already have one of those, do we?). To be honest (even after finding out about it days ago) I didn’t see the last panel coming. 😛 I also like the idea of Sonic and Tails being mountain climbers, probably just because I like BOTH Sonic and the game “Ice Climber”. Did you seriously have an idea for all 8 of those series’, because if so then I’d like to hear the Fire Emblem idea ’cause I luvs me sum Fire Emblem. Also Pokémon. I’d also like to see the pokemon and fire emblem pie pieces, but anyway NCG didn’t see that wheel coming, heh astronout plumber . What has Sega been doing lately? And love “Parka Sonic and Tails”, cool pic Ray. I really hate to say this but REALLY?!? We are essentially shown a 2D gameplay Sonic sans retarded friends with 3D graphics that has me drooling like Klonoa 2 was just unveiled and we’re on the “ZOMG, stolen from Nintendo” bandwagon? I keep forgetting, Sonic = Instant Phail. Damn, I feel like I’m back in grade school having to defend a Sonic game nobody has even touched yet, as if we live in a world where only Sonic or Mario can exist, instead of both. Sega has rediscovered what worked with Sonic on the DS (and it isn’t Bioware) and they bring it to consoles and people have to find the ONE bad thing about it…. Well I’d like to see the wheel in desktop format, except not spinning, but then Tim’d have to think of something for Pokémon and Fire Emblem and Ray’d have to waste extra time away from his girlfriend to make 2 extra pie pieces. I mean, that totally takes 7 days and we’ll miss the next web comic, amirite? What is that clock supposed to be? The HUUGEE rellease of the Wii clock or am I wrong? Because that icon is throwing me off. Great comic, guys! Love the picture of Sonic on the Landmaster! …Ray’d have to waste extra time away from his girlfriend to make 2 extra pie pieces. Sorry, but you’re not correct on that. NCGWhat is that clock supposed to be? The HUUGEE rellease of the Wii clock or am I wrong? Because that icon is throwing me off. It’s Sonic’s version of the Game & Watch. Sad, but true. It should have been called the wheel of dumb gameplay mechanics. I really am sick of them having a game that looks awesome, then telling me about the lame gameplay mechanic. Wolf-Sonic? Yeah, that’s a bit un-original. The whole Link transforming thing in Twilight Princess isn’t unheard of though. I direct you to recall Link to the Past for reference where Link was turned into a bunny in the Dark World until obtaining the Moon Pearl, which makes the wolf from in Twilight Princess much more appealing by comparison. Also, Bunny-Link was completely useless, at least Wolf-Link has some fighting prowess! Also, the Wheel of Fate would, indeed, make a cool wallpaper! Perhaps something to revitalize the Extras section a bit?? As if werewolves were created by Nintendo. Sheppy has a point, Okami anyone? but Sheppy, Sonic games have equaled fail lately, and it’ll take more than some decent, very early, video to rectify all the bad choices and games as of late. Really hope you’re not gonna hold your breathe on Unleashed. Do we have even official confirmation the Sonic Unleashed is happening? Last I saw, it was just pictures and a video that got leaked. Also, I would really like to see a Pokemon pie piece. Sonic, Zelda, and Okami.All three games have wolves, BIG FREAKIN’ WHOOP. The three games are sooooo different DOES IT REALLY MATTER if they all have wolves? Do you have any idea how many WWII games there are? Do they copy each other? Yeah it’s confirmed, I saw on Sonic Cult the other day how they found the information. Basically SEGA’s really dumb with their Press Site, so much so that they pretty much gave you log-in info. It was in a folder named Game Informer Exclusive. Oh, and @ everyone else: Chill out. The main problem I have with the wolf thing is that it’s a dumb idea. We don’t need a pointless gameplay feature to be tacked on. –Fire Emblem Pie Piece – Sonic, Tails, and Kunckles are dressed up medieval style. Sonic has a long sword (Paladin), Tails has a cloak and a book (Priest), and Kunckles is in thick armor and has an axe (Axe General). I can see Eggman as a Dracoknight now… Rouge is a Rogue – er – Thief… hmm… Where to put Shadow…? The first game I though of wasn’t really Zelda, but instead I remembered Altered Beast. You know, a Sega game where the main characther turns into a werewolf-type beast. -Would also think of a Sonic themed Mother RPG, but I guess Bioware is working on that. Play some handheld Sonics. Sonic Advance was brilliant. Sonic Advance 2&3 started focusing more on pure speed and cheap shots and the Sonic DS series has been pretty solid as well (except the damn charge springs in Carnival Zone). Lately the Sonic 2D games have been more about pure speed and cheap shots instead of speed sequences being those few nuggets in between elaborate platforms where you get pumped. From what I saw of the video, it looks like this new Sonic is a return to that form but with much more processing power. As for the werewolf bits, do we even know how that’s gonna work yet? Could it actually be something along the lines of certain levels are when the moon is out, Sonic obtains all new “werewolf like” abilities such as higher jumping, wall climbing, strength to break down barriers he couldn’t before? And if that’s the case, could we be seeing more evidence of trying to scale back the roster in the form of putting Sonic in Knuckles style levels? I don’t know yet, I want to know more on how the werewolf aspect will work before I judge it. Because we can wax poetic about how stupid it is all day but the video game industry as a whole is filled with stupid ideas just like this one. Put on a Racoon Suit to fly? I mean, OMGWTFBBQ! Not to mention King Wart is destroyed by eating his vegetables. But those ideas made for fun gameplay, who’s to say Werewolf Sonic won’t be the same way? Sticking to the handheld sonics has taught me one thing, it’s far too early to give up hope completely. @Rioluke: Yes. Yes they do. Here’s how I see it. Okami took Zelda’s basic formula/gameplay, and Zelda then took the whole wolf thing(shadow beast encounters anyone?) from Okami, but regardless those games are very similar adventure titles, Sonic is not. The wolf thing seems more like a gimmick than anything else(to me), not an attempt to spice up great gameplay for a sequel(like in Twilight Princess). @Sheppy: I played all the portable Sonics, Advance 1 was good, Advance 2+ were boring(could hold right and tap jump through every stage), Rush(and Adventure) were also kinda boring(lotta text in Adv.) but showed improvement, and Rivals was bad. But still, the portables are why I still have some hope. And I don’t think they should kick out Knuckles for any reason. That’s like giving Sonic a jet-pack and canning Tails, Tails and Knuckles are the good sidekicks. If you ask me they should get rid of all introduced characters after Sonic CD. And about the racoon suit, first Mario game he used mushrooms to become big, and a flower to shoot fireballs, racoon isn’t that far off from these concepts. Anyway, I’m just not gonna hold my breathe for “Unleashed”, but I’m not condemning it yet either, much too early for that regardless and I wanna see how this plays out. But as a betting man, I don’t think this is gonna work. And lol on “OMGWTFBBQ” . Sonic turns into a wolf? I haven’t heard that. Great comic though. 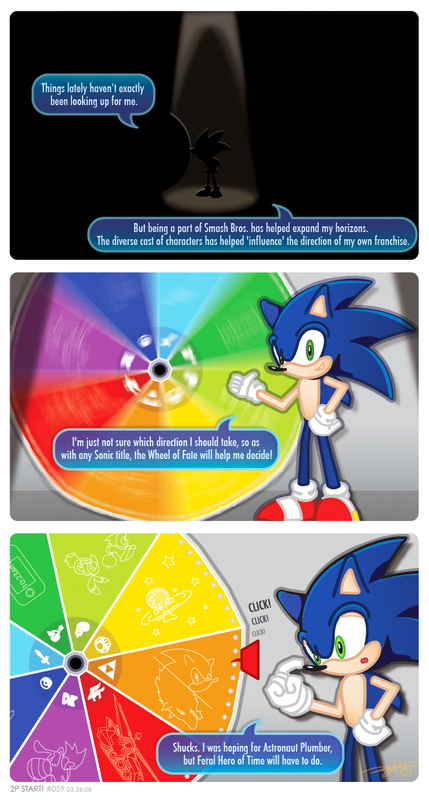 Poor Sonic is Sega’s whipping boy. Infact there has been a wolf in a previous sonic game “Tails’ Skypatrol” for the game gear. He is called: Fockewulf, one of Witchcart’s henchmen, a blue male wolf who rides on a flying motorbike. It’s funny because I like Sonic; i just stopped playing the games after the Genesis. (Similar to how I stopped playing Mega Man games after the SNES.. ok i lie, i stopped after X4). I didn’t even notice the Brawl icons on the wheel at first because I was too busy having fun trying to figure out what the pictures themselves were first. Also, I hadn’t realized Sonic would be transforming into a wolf. I just saw pictures and assumed he was turning into some sort of de-evolved hedgehog (say, a bandicoot, or something =P). Pity. That would have been more interesting than the wolf concept. i gotta say that was my first thought about this new sonic game and my second one is that maybe, just maybe, the wolf sonic is some sort of enemy, but that’s stretching it. @Gewurztraminer : You stopped after X4? Really? I stopped the X series after X6, if you get a chance I think you should play X5 & X6, they were very good. Oh, and the Zero series was also very good in my opinion. @alxfbn: I like the Enemy wolf sonic idea, except that it really reminds me of Crunch from Crash Bandicoot Wrath of Cortex. You say that like Twilight Princess was the first time the werewolf idea was used. Sonic’s already an animal. This is odd. But either way, can anyone link me to whatever this comic is talking about? Thanks! Yes, it was funny. I actually liked the idea of wolf link and had a lot of fun playing as him. wolf sonic is just a stupid idea, but I’m not a sonic fan so….. I just hope atleast theres a gameply reason for the wolf deal…and i hope its a better gameplay than shadows gun aprach. Still,theress no arguing,videogames got a lot of wolf latly. So hes like,a Hedghehog-Were-Man-Wolf thing lol. Is there even a single image of Sonic as a wolf yet? Gah, what’s up with people saying Zelda “copied” Okami’s wolf? I could have understood it if the games were released years apart, but they weren’t! Average game development time: 2-4 years! The games were developed simultaneously! Neither game copied the wolf part from the other. It was thought of and implemented at the same time. Really, makes no sense to even say that one or the other was ‘first’ with it. XD Looks like Sonic landed on Fire Emblem this time with the new announcement of Sonic and the Black Knight! Do you think we could get a full shot of that wheel just to see the other choices? I would have loved to see most of these also made as games. Especially the hidden Pokemon and Fire Emblem. Though, if you consider Fire Emblem as Strictly a swordplay game, Black Knight happened, and if you consider Pokemon as Strictly an RPG, Chronicles happened.